Hey, Lisa back today with a fun post! 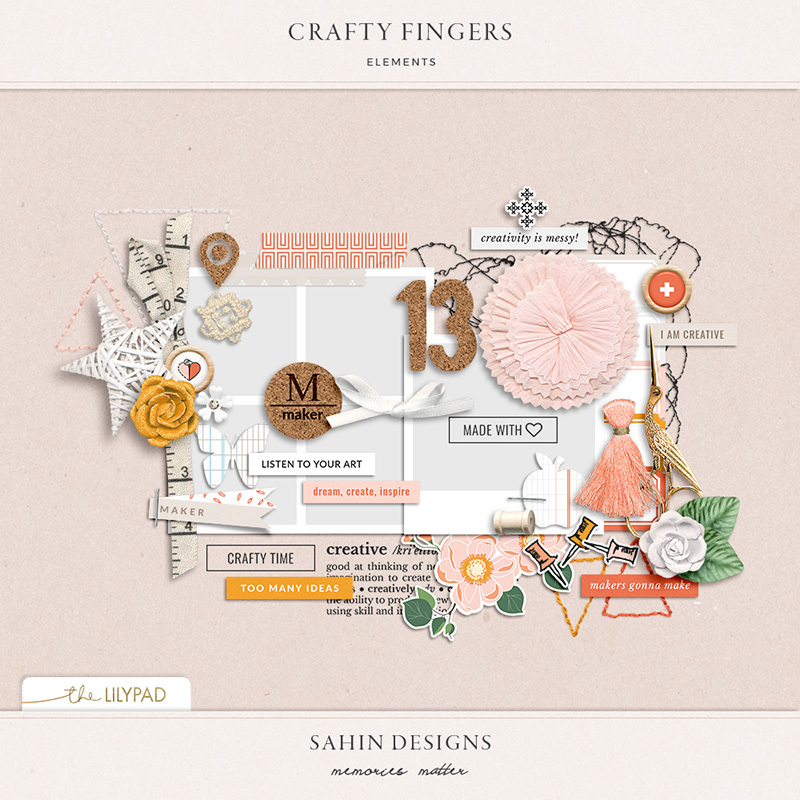 I am going to show you how I get inspired to tell different stories from the Sahin Design products. Let’s get started, shall we! Whenever I get a new collection I always check out the word strips and pocket cards first. That is where you can see what theme the collection has, but I don’t always use it for the theme. Here is an example; the Garden party collection is clearly one to use for your garden memories and I have tons of those too, but I used one of the elements to tell a different kind of story. I used the circle element that says “I will survive” to tell a story about a nasty case of pink eye. I used that circle to mask my nasty eye and a prompt to tell the story about how bad I was feeling, and that I did survive. Here are a few more photos. In this layout above I also used one of the cards from the Chapters collection. I love cards that are numbered or otherwise list related. Other times I do get inspired to scrapbook something that is related to the theme of the kit. Like with the Crafty Fingers collection. It is one of my favorite collections! I got inspired by the two fun word strips that say “creativity is messy” and “makers gonna make” to tell the story about how I am creative and messy. In the above layout and the next one I have used pocket cards that are open for any kind of stories. The above one comes from the Infinity collection and for this next one I used the vertical pocket card from the Just Because collection (another all time favorite!) Cards that has sentiments like these are so versatile and fun to use for so many projects! Listing things I am loving right now, like I did here, is such a fun way to memory keep. You can also choose to tell one more specific thing. So to conclude; look at the different elements in the collections to get inspired all kinds of stories! Once you have a chance to read the article, I’d love to hear your thoughts on the topic in the comments section below. What inspires you when you design scrapbook layouts? Is there anything specific to prompt the stories you tell? Lisa is a hybrid scrapbooker who loves to knit, finding hearts in nature and dandelions. sur la conception des pages viennent très facilement . Thanks for the idea. I never thought to look at the cards and word art for inspiration. Will definitely be trying that. Thanks for the great tip.